“Teacher as Designer” is one of the main themes at KCELT, and Ben Foley is a great example of this. He designed modular workstations for his students in the Automation and Instrumentation Technologies (AIT) program in the Industrial Technologies Department for the purposes of making their learning more relevant to the industry. At the end of the video, Ben states, “”There’s nothing like it even in the States as far as I know from just a university or community college offering,” demonstrating how innovation emerges from a designer mindset. Students are now able to directly apply their work in the classroom with the same technology found in the industry. 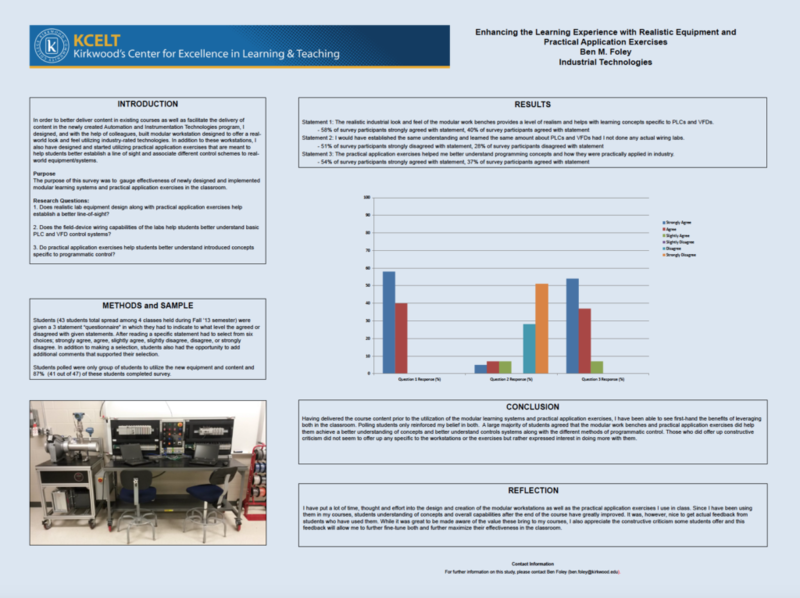 Last year, Ben presented how and why he developed these modular workstations at the Master Teacher Program Year 3 poster fair. Students are in their second year using these workstations, so we should be able to assess their effectiveness once they graduate and enter the workforce using the same or similar technologies. This workforce solution is funded by the I-AM Consortium which is 100% financed through a $12,951,165 grant from the Department of Labor’s Employment & Training Administration. The product was created by the grantee and does not necessarily reflect the official position of the U.S. Department of Labor. The Department of Labor makes no guarantees, warranties, or assurances of any kind, express or implied, with respect to such information, including any information on linked sites and including, but not limited to, accuracy of the information or its completeness, timeliness, usefulness, adequacy, continued availability, or ownership. Ben has been working at Kirkwood Community College since 2011 and has been working in the field of automation since 2003. He began development of the new AIT program and preliminary lab designs in 2012. He believes students in his program learn by doing and strive to offer them a hands-on experience second to none.